Whether by initiation or invitation, I have spent more time recently with my girlfriends that I have in years. I never been one to keep tons of girlfriends, I always did have a constant in my life and she is like a sister to me, someone that I treasure in a whole different level. But now in my second half of my life, I am devoting more time to the women friends in my life. Midlife has brought a deeper appreciation for my female friends, they are like sisters we collect by choice and these choices have stood by me in tough spots, commiserated with me through challenges, celebrated successes and breakthroughs, and called me on my “stuff” when I need to stop being part of the problem. I value their love and honesty. They help me stay on track towards becoming a better, healthy me. As we grow older, we will encounter more challenges, good and bad, but my network of girlfriends will be there to strengthen and cheer each other to the finish line. So this weekend as we sat on a park enjoying our monthly Chica Brunch, soaking up the rays of the sun and feeling the breeze in our faces from the nearby river, all the while sharing plates of food and stories I realized that I would not trade this girlfriend power for anything. Here we are different types of women, from all different walks of life, different places, different personalities, bound by one thing, – sharing our journey together. A frittata is just like that, bringing together different types of ingredients and flavors all bound by the strength of the beaten egg and at the end resulting in the quintessential comfort food. Easy and fast to put together with infinite ingredients combinations, the frittata is always a crowd pleaser and a sure bet on a lazy Sunday morning. Use between 6-12 eggs—8 is probably the most common number. 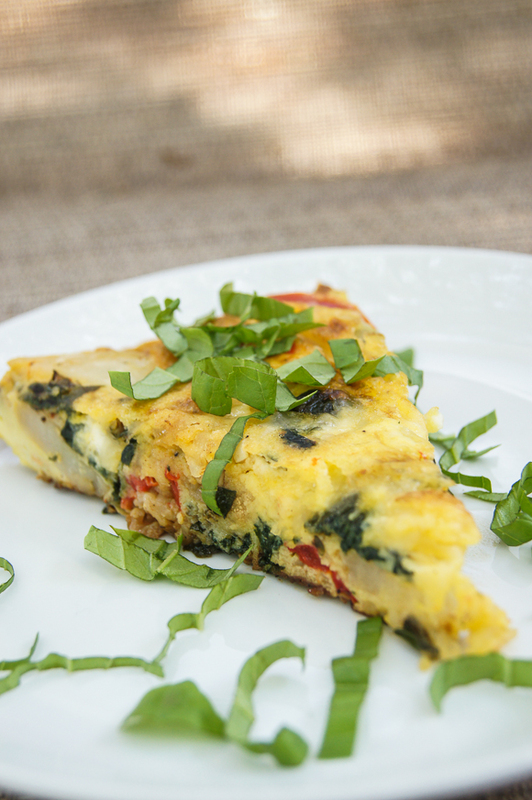 Too many eggs can be a bit difficult to handle, especially if the frittata is turned over. If you have a broiler, you won’t have to worry about flipping over your frittata. Just stick the pan under a low flame and remove when the frittata is golden and puffed up. Use a 10-12” pan with a thick bottom and round borders. A sturdy, nonstick pan makes it easier to detach the frittata without having to add extra butter or oil. Fill a large, deep saucepan with water (about half way) and season with salt (make sure to taste the water, it should taste like the sea). Put on the stove over medium-high heat. Peel your potatoes and cut into round pieces (make sure they are the same thickness, since it will help cook evenly) then dump them in the water – careful you don’t burn yourself. Cook until fork tender, turn over a colander to drain water and then put cooked potatoes on a large plate, spreading them and put in the refrigerator to cool off. When cool – taste and if needed, sprinkle with a bit of salt, slice thinly and put aside. Note: during the next step as you add the set of ingredients, make sure you season with 1-2 pinches of salt and a turn of ground pepper lightly, this built flavors as each layer cooks. In a bowl, beat your eggs, add half of the chopped basil and season with a pinch of salt. Set aside. Heat oven broiler, to high. Heat oil in an ovenproof 12” nonstick skillet over medium-high heat. Cook garlic, pepper, and onion until soft, 3-4 minutes. Add spinach; cook until wilted, about 1 minute (make sure you turn to combine) Stir in reserved potatoes, the butter and season with salt and pepper. Gently with a spatula, mix and spread the mixture around the pan evenly - Grab a fork and taste everything together and adjust the seasoning if needed. Add in the beaten eggs, making sure to cover the cooked mixture. Spread the ricotta cheese all over and add about ½ of the cheese mixture. Reduce the heat to medium; using a spatula, gently work around the edges and lift just a teeny bit in order for the eggs to distribute evenly on the pan. Cook until golden on the bottom and the edges are golden and the center is beginning to set, 8-10 minutes. Remove it from the stove; add the rest of the cheese to the top and place under your oven broil until set and golden on top, about 3 minutes (DO NOT WALK AWAY at this point, make sure you keep an eye on it – in fact you can keep the oven door open and take a peek) its going to be ready when you see it puffed up. Make sure you use an oven mitten to grab the hot handle*, remove from the oven and slide the frittata onto a serving plate or cutting board and garnish with the rest of the chopped basil. Let it rest for 5 minutes, then cut into slices and serve. *A quick tip, when you take you frittata out of the oven keep the oven mitten or towel over the handle to remind you that it is hot. You don’t want to grab that handle thinking its all good; because it is certainly NOT all good…you could really burn yourself.